The best of travel: do stuff or buy stuff? I’m working on trip budget and planning for the great Tracy and Dana in Africa! trip and have run into a question of priorities. Even using miles to get across the ocean and Holiday Inn points in Paris, I can’t swing both *doing* stuff and *buying* stuff. I don’t mean to sound like a shopping fiend obsessed with “things” — it’s not that. But I do love to bring home treasures that will remind me of my travels. We cook almost every day with our copper from France. The oil lamps hanging over our kitchen sink take me back to Rhodes, and stirring dinner with the hand-carved spoon from the guy in the Turkish hillside makes me smile. 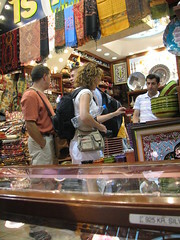 Marrakech (not to mention Paris) is a dream for this kind of shopping experience. The spices! The lamps! The carpets! But I’m not travelling these thousands of miles to bring home trinkets. I want to take a hammam, to venture out to the mountains and valleys near Marrakech. To take a cooking class, and in Paris a photography workshop. These experiences add up to no dirhams or euros for a goodie from the souks or from a Parisian shop. So I’ll sigh as I pass the heaps of tempting goods. And I’ll remind myself that the 20kg weight limit on EasyJet means I couldn’t take it home anyway. And I’ll take a million pictures, and write about every experience, and that will be my treasure. ← Wow, so I’m going to Morocco! I’m really a “do stuff” more than a “buy stuff” person, since to me the best souveniers are the photos we take and the drawings my husband makes in his sketchbook. (Of course, when you lose your camera as I did in Italy, it makes for a good story but bad when it comes to having things to look back on to remind you of the trip.) We’re more likely to buy “stuff” for other people rather than ourselves. I think the only things we buy are things that you just can’t get anywhere else in the world. These days, those sorts of things are pretty rare. I can’t think of losing anything worse than your camera (and I’ve lost a purse loaded with all my important stuff!) — that’s terrible! don’t we all wish we could do both… do and buy!! It’s such a toss up for me. The experience is key… but so is the stuff you bring back. But, I tend to bring back perishable items… so in the end, I believe my vote is for ‘do stuff’.